Would a C by another other name be as sweet? …Or some other wrong paraphrase of a poorly-remembered Shakespeare line. This is the post where I write down all the nicknames we have made up for C and regularly refer to her with so I won’t ever forget them. Nicknames sometimes have a short shelf life, but that doesn’t mean they’re not special. Rainbow Brite would also work. And yes! I still call her Bebe like back in the day when she was still cooking! She will always be my little Bebe. I don’t get the fixation on rabbits. That just sort of happened without much thought. We joke that she doesn’t even know her real name. Oh well. She has a lifetime to learn it. Do you have any pet names that only your family calls you? I love it! I think I would definitely come to my name if it were Cake. She’s adorable no matter what you call her. Those unrepeatable names are hard to forget! My husband calls me his choo choo bear and when I was pregnant tubby tumkins. To which I was not amused. The twins are the twins, real creative. Sometimes we refer to them as heathen 1 and 2. Or honey boo boo and chupacabra(spell check please). The older children have all outgrown nicknames. The wee man is Connie or momma’s cutest little man! Honey Boo Boo and Chupacabra would make an excellent show on Discovery! She is gorgeous! My name is Kathleen, everyone called me Katy, except my littles brother who couldn’t say it – he called me KayKay (still does). My other siblings all call me Sis. My Grandpa used to sing K-K-K-Katy, beautiful Katy, you’re the only g-g-g-girl that I adore. I miss him. I called my younger son everything but his given name – Bubba, Jake, Bubba Jake, Snake, PePe LePew, Jose, Bro-cephus, Bro-Bro or Jesus (as in Hey-Seuss). His name is Jason. C’s middle name is Kathleen! (As is mine, except with a C instead of a K.) I love that name! Binx. When I got vanity plates on my first car out of grad school, the state delayed my application. My all-older siblings (who had dubbed me Binx in the first place back in the age of Aquarius) surmised that it may have stood for something like “Ban IntraNuclear Extinction devices,” and that’s why they wouldn’t approve it in a timely manner. They eventually approved it and Binx I was. Only until the Age of Childbearing. I think Miss C’s nicknames would be cool on vanity plates! I really love the sound of Binx! It is punchy and cute, just as all nicknames should be. Lils, Lilith, Lily of the Valley, Bee, Der Lil (german for “the lil”), Lal-oo, Leelee or lyly (those are from my brother) Nick names are fun right? I always loved them and I was super sad that my name was so short that I never needed one. Lils is always good though. One of the nicknames I made for my cat Cozy (Cozette) that I’m super proud of is Cozetta Stone. Like Rosetta Stone. You know something is funny when you have to explain it, right? My fave C nickname is Connie Coney. Hahah rolls right off the tongue. Hahaha Connie Coney is a name B gave to her. Like I said, I have no idea why there is such a fixation on rabbits with her nicknames. I guess we subconsciously think they’re cute. I totally got the Cozetta Stone reference. I am constantly having to explain my jokes too so we are both equally hilarious. People are always trying to call me “Jan,” which I hate. No one outside of my family is allowed to call me anything other than “Janice.” And, no one in my family calls me “Janice.” My husband calls me Boo Boo. My daughter calls me Moo Moo. My son calls me Schmiggy. My sister calls me Bean; my brother calls me J (not Jay) . My mother called me Squeaky and my dad called me Pig Pig. I have a million names for my kids, but my favorites are sweet pea, peanut and peanut head. Ah! That reminds me! I also call her Boo and Boo Boo all the time. It’s kind of funny because when I was growing up, that’s how my parents referred to poop so now when my mom hears me call her that it grosses her out. I also call her Beanie. It’s so cute! You just want to eat her all up she’s so cute! I love Buney — BYOO-ney! I like that one too! It somehow fits her really well. Looks like Lily covered her nick names although when she was Cee’s age I called her Sweet pea or just Pea and sometimes, inexplicably, Julie. I know, weird, right? My family called me Lee or LeeLee, or Liesel. Cee is looking awfully sassy in those stripes – Sandee and I have the same idea. We just wanna eat her up. Love her! I LOVE those little pants she’s wearing in the picture! Can you believe that they are size 12 months and she has almost grown out of them at 9.5 months? She is getting way too big. My dad used to call me Pork Chop. I have nothing else to say about that. Wasn’t that Doug’s dog’s name? For that alone it is an excellent nickname. I guess that might be right. Maybe it will grow on me. My full name (which is Spanish & I inherited from my grandmother) has it’s own nickname. It is a common nickname in Spain – Loli (no, not LOW-LEE, which is how all gringos pronounce it. It’s more like Loh-li , sorta) It’s evolved with age. My brother has always called me LO. But you have to remember: “whatever Lola wants, Lola gets” ;D That’s a pretty sweet trade-off, right? Thanks for commenting! Hehehe I like Wee Cee too. I wish I had thought of that one earlier! If I ever meet you guys I will call him Delorean because any reference to Back to the Future is fantastic. In fact, C got B a BTF tshirt for Christmas! We have a slew of names for Tiny Geek [insert slices of real life here]: The Popster, Popsicle, Poop Meister, Abaddon, etc… My father used to call me Pepé Le Pew… There you go. Have fun. Even though I’ve never met her, I feel like Tiny Geek’s real name is the best name for her, ever. So fitting! What we all really want to know is what you and Sara call each other when it’s just the two of you. I bet y’all have some adorable pet names. She looks so big now! My brother used to call me a variety of names eg Loreal, then he’d go, ‘because you’re worth it. Or, less favourably, Chubby Checker, then he’d go, ‘guess again, Chubby Checker’. She is huge! She’s already wearing her 12MO clothes even though she’s only 9MO. I am kind of impressed that a little boy was even aware of Loreal! Yeh, there was an advert on TV that he must have been copying. Little C is getting big. Isn’t the act of growth and learning so amazing to view from outside?! I never even think about my childhood but seeing other children grow, everything they do is so memorable. You don’t realise it as a kid. My parents called me “Accident” which was really confusing on a kid because every time I heard about a car accident I thought someone was calling my name. It got a new meaning when I was older and fully understood what they meant. My parents called me Volvo because that’s where I was almost born due to a snowstorm on my birthday. I swear when I started reading this I thought you were going to say it’s because that’s where you were conceived. If that were the case my parents would have called me “Grandma’s Long Beach Island House 1987” I hate that I know this. Doodle is Jude, Joodle, Doodle-Bug, Little Dude, Bubba-doo, Bub, Scootle, and Baby Dude on any given day depending on who is calling him. Then there’s all of the darling, sweetie, and CHILD! terms of endearment, and the always pleasant full-name for those special moments of his days. “Baby Dude” has a wonderful ring to it! I could for sure croon that one in a pinch ;D My mom has had some great aunt names too. Waaaaay before I was born, my cousin always called her “Teasley” for some reason, which always sounds like a pickle or a British butler. Squish is, well, Squish. As well as boo-bear, pooterpants, tooter-pie, skunky monkey, and a few I can’t think of right now. My daughter was “Stinky” from the day she was born. Until the day that we realized that she did not know her actual name. She introduced herself to someone as “Stinky” and added our last name. The Padawan was the Tookey Bird. I am not sure why. If there were explanations behind these names, they’d lose all their credibility. The more random and bizarre, the better. My cousin totally calls me “Dup Dup” to this day because he is 2 years younger than me and couldn’t say Crystal! I don’t know how Dup Dup is AT ALL similar. But then, I still call my daughter Lilahkin Skywalker. ?? BYOO-nee is the most adorbs. 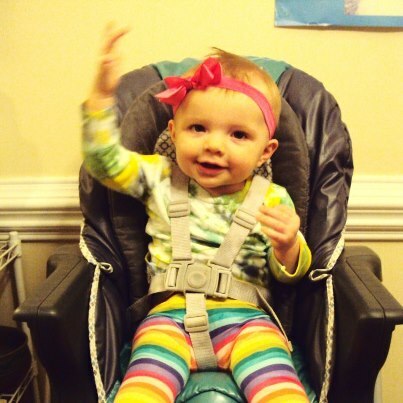 She’s rocking those rainbow pants. My boys are Austin and Miles, and they are Little Turkeys most of the time, but also: Ozzy, OzzyB, ZB, Mr Miles, Mice, Micers, Mr. Pants (a nickname inexplicably inherited from our dog Willis), Boo, and most frequently STOP DOING THAT RIGHT NOW. Wee Cee looks adorable as she gives us all the hand … I have no recollection of what I was called as a youngster, but once I reached adolescence, my mother frequently referred to me as “jackass” especially when I would open a can of frozen orange juice, eat a few spoonfuls of it, then stick that can back in the freezer. We were at odds at that time. My son calls me Mumu – he started when he was a teen, so difficulty saying mommy was not an issue. Regardless, Mumu has stuck. He even asked me recently if I minded the name, but of course I don’t, because he says it with love.